Lauya is an Ilokano dish it usually consist of pork knuckles and vegetables but some variations uses beef knuckles. Lauya is basically a counterpart of the tagalog nilaga dish and obviously the word “lauya” in Ilokano is “nilaga” in tagalog or in English which is “boiled”. Cooking this dish is simple, just throw everything in the pot then put it on the stove and cook. But this recipe has one more step of smoking the pork knuckles (cold smoke process) that will give the meat a more savory country style flavor. With regard to smoking the meat, don’t use scrap wood like those used in construction or furniture because they have chemicals to treat the wood. Use only natural unprocessed wood like branches of a tree or firewood. You can also grill the knuckles if smoking seems tedious to do. 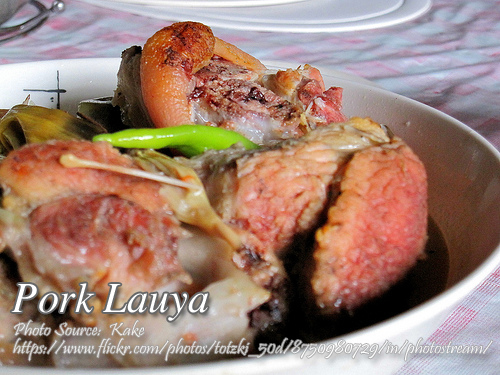 Lauya is an Ilokano dish it usually consist of pork knuckles and vegetables but some variations uses beef knuckles. Chop the pork knuckles or let the meat vendor chop it for you about 1 and ½ inches thick. Wash and clean the pork knuckles, remove or shave the small hairs if you found any. Then smoke the pork knuckles using the cold smoke process. You can also grill the pork partially to improve the taste if you don't want to smoke it. Set aside. Heat a big wok in medium to strong fire, then add the smoked pork knuckles, let it sizzle for a few seconds then add onion and garlic, potatoes, cabbage, ground black pepper, bay leaves, patis and water. Do not mix or stir. Cook for 2 hours or until the meat becomes tender. Then add sugarcane vinegar or sukang Iloko and cook for another 25 minutes. Again do not mix or stir. Serve hot in a soup plate.